“The physiological ratio of these two isomers is 40:1 (MI/DCI) and seems to be an optimal approach for the treatment of PCOS disorders.” M. Bizzari and G. Carlomagno. Inositol: history of an effective therapy for Polycystic Ovary Syndrome. European Review for Medical and Pharmacological Sciences, 2014; 18:1896-1903. “Ovarian reserve in the oocyte-specific Pdss2-deficient animals was diminished, leading to premature ovarian failure which could be prevented by maternal dietary administration of CoQ10. We conclude that impaired mitochondrial performance created by suboptimal CoQ10 availability can drive ageassociated oocyte deficits causing infertility.” Ben-Meir, A., et al. Coenzyme Q10 restores oocyte mitochondrial function and fertility during reproductive aging. Aging Cell. 2015; 14(5): 887-895. “In women undergoing in-vitro fertilization, a sufficient vitamin D level (greater than or equal to 30 ng/ ml) should be obtained.” Lerchbaum E and Rabe T. Vitamin D and female fertility. Curr Opin Obstet Gynecol. 2014 Jun; 26(3):145-50. “Our clinical study demonstrated that melatonin treatment for infertile women increases intra-follicular melatonin concentrations, reduces intra-follicular oxidative damage, and elevates fertilization and pregnancy rates.” Tamura, et. al. Melatonin as a free radical scavenger in the ovarian follicle. Endocrine Journal 2013; 60(1): 1-13. FH-PRO is offered for sale exclusively on fh-pro.com, through trusted health care provider’s offices, and in authorized, reputable pharmacies and health food stores across the United States. Chromium (as chromium polynicotinate) Trace mineral that enhances the action of insulin; research suggests giving chromium for as little as two months improves insulin sensitivity by more than 30% in obese women with PCOS. Myo-inositol Insulin sensitizing agent; helps reduce insulin resistance in women with PCOS; improves egg quality; even mild elevations in blood sugar and insulin negatively impact fertility in all TTC women, not just those with PCOS. 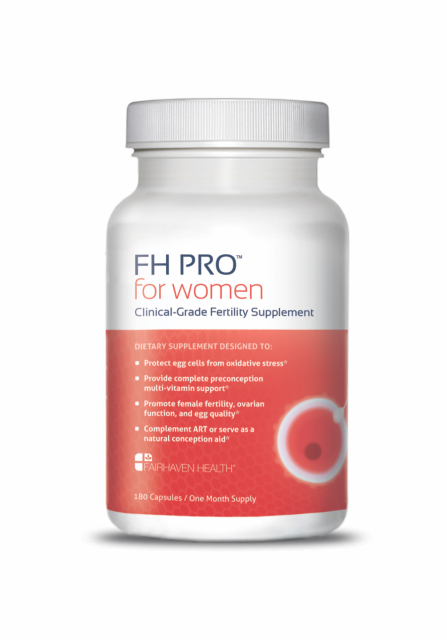 D-chiro-inositol Improves insulin sensitivity, ovulation, and serum androgen levels; FH PRO for Women contains 40:1 ratio of myo-inositol to d-chiro inositol.